According to Jewish tradition, God revealed the Pentateuch to Moses. The Pentateuch (from Greek: Πεντετεύχως [meaning "five books"]) refers to the most important scriptural writings of Judaism, which constitute the Torah (divine law). They form the core of the Tanakh, or Hebrew Bible. In Christianity, the Pentateuch forms the beginning of the Old Testament. The books of the Pentateuch are traditionally said to have been revealed by God to the prophet Moses. For observant Jews, the significance of the Pentateuch lies in its divine commandments, which constitute the Torah, the divine Law or Teaching that defines a life of holiness. Christians read the Pentateuch primarily as the opening chapters of salvation history, depicting God's creation of the world, the Fall of Man, and the stories of Abraham, Sarah, Isaac, Rebekah, Jacob, Joseph, Moses and Aaron—men and women of faith to whom God revealed himself and who overcame obstacles to do his will. The Samaritans also revere a version of the Pentateuch. The following is a brief summary of the contents of the books of the Pentateuch. Genesis begins with the story of Creation (Genesis 1–3) and Adam and Eve in the Garden of Eden, as well as the account of their descendants. Following these are the accounts of Noah and the great flood (Genesis 3–9), and his descendants. The Tower of Babel and the story of Abraham's covenant with God (Genesis 10–11) are followed by the story of the patriarchs, Abraham, Isaac, and Jacob, and the life of Joseph (Genesis 12–50). God gives to the Patriarchs a promise of the land of Canaan, but at the end of Genesis the sons of Jacob end up leaving Canaan for Egypt because of a famine. Exodus is the story of Moses, who leads the Israelites out of Pharaoh's Egypt (Exodus 1–18) with a promise to take them to the Promised Land. On the way, they camp at Mount Sinai/Horeb where Moses receives the Ten Commandments from God, and communicates his laws and Covenant (Exodus 19–24) to the people of Israel. Exodus also deals with the violation of the commandment against idolatry when Aaron took part in the construction of the Golden Calf (Exodus 32–34). Exodus concludes with the instructions for building the Tabernacle (Exodus 25–31; 35–40). Leviticus begins with instructions to the Israelites on how to use the Tabernacle, which they had just built (Leviticus 1–10). This is followed by rules concerning clean and unclean (Leviticus 11–15), which includes the laws of slaughter and animals permissible to eat (see also: Kashrut), the Day of Atonement (Leviticus 16), and various moral and ritual laws sometimes called the Holiness Code (Leviticus 17–26). Numbers takes two censuses where the number of Israelites are counted (Numbers 1–3, 26), and has many laws mixed among the narratives. The narratives tell how Israel consolidated itself as a community at Sinai (Numbers 1–9), set out from Sinai to move towards Canaan, and spied out the land (Numbers 10–13). Because of unbelief at various points, but especially at Kadesh Barnea (Numbers 14), the Israelites were condemned to wander for forty years in the desert in the vicinity of Kadesh instead of immediately entering the Promised Land. Even Moses sins and is told he would not live to enter the land (Numbers 20). At the end of Numbers (Numbers 26–35) Israel moves from the area of Kadesh towards the Promised Land. They leave the Sinai Desert and go around Edom and through Moab where Balak and Balaam oppose them (Numbers 22–24; 31:8, 15–16). They defeat two Transjordan kings, Og and Sihon (Numbers 21), and so come to occupy some territory outside of Canaan. At the end of the book they are on the plains of Moab opposite Jericho ready to enter the Promised Land. Deuteronomy consists primarily of a series of speeches by Moses on the plains of Moab opposite Jericho exhorting Israel to obey God and giving further instruction on his laws. At the end of the book (Deuteronomy 34), Moses is allowed to see the Promised Land from a mountain, but it is never known what happened to Moses on the mountain; he was never seen again. Soon afterwards Israel begins the conquest of Canaan. Classical Judaism recognizes the Pentateuch as containing a complete system of laws, particularly the 613 mitzvot ("commandments"), which constitute the Torah, the divine law that governs the life of observant Jews. Virtually all contemporary biblical scholars date the completion of the Pentateuch no earlier than the Persian period. The process by which this final Torah was arrived at is still the subject of debate: The documentary hypothesis proposed in detail by Julius Wellhausen in the late nineteenth century, which dominated the field for the majority of the twentieth, has come under intense questioning in recent years. Yet, although alternative theories have been advanced, none has found the same general acceptance that Wellhausen's once enjoyed. The Jahwist (or J)—written circa 850 B.C.E. The southern kingdom's (that is, Judah) story of national origins. It is named according to the prolific use of the name "Yahweh" (or Jaweh, in German, the divine name or Tetragrammaton) in its text. The Elohist (or E)—written circa 750 B.C.E. The northern kingdom's (that is, Israel) story of national origins. As above, it is named because of its preferred use of "Elohim" (generic name for "god" in Hebrew). The Deuteronomist (or D)—written circa in the seventh century B.C.E. either from the time of King Hezekiah or Josiah of Judah; it is confined largely to the book of Deuteronomy. Some scholars think this source continued into Joshua and most of the subsequent books up to 2 Kings; however the majority view, first put forward by Martin Noth, is that the books of Joshua, Judges, Samuel and Kings were assembled by an editor called the Deuteronomistic Historian whose ideas and style were derived from D. There is also a theory that the last chapters in Deuteronomy were added by a second Deuteronomist editor to correspond with conditions during the exile. The Priestly source (or P)—written during or after the exile. So named because of its focus on Levitical laws. There is uncertainty about to what extent P was an independent source or an editor who combined priestly laws and lore with an older document ("JE," combining J and E) in his possession. A number of smaller independent texts have also been identified, including the Song of the Sea (Exodus 15) and other passages, mainly in verse, most of them older than the four main texts. A few scholars have posited a "Hexateuch," a term for the first six books of the Bible. In this view, the Pentateuch seems incomplete without Joshua's account of the conquest of the Promised Land. The Book of Joshua would complete the story, continuing directly from the events of Deuteronomy to document the conquest of Canaan predicted in the Pentateuch. More recently, the critic Harold Bloom reconstructed a hypothetical "Book of J," extending the J source to the establishment of the Davidic monarchy. In this view, the logic of a nation originating with Abraham's wandering about the land is completed by King David, who establishes the sovereignty over it. However, this posited extended J narrative no longer exists, having been supplanted by the Deuteronomistic History of Joshua through 2 Kings. As for the Pentateuch, it is most likely that in its final post-exilic form as codified by Ezra, the story deliberately ends outside of the Promised Land, in order that its laws may serve as a guide to Jews who were themselves living in exile. Still other scholars have proposed that Deuteronomy stands apart from the first four books of the Pentateuch, and so speak of the first four as the "Tetrateuch" (Genesis through Numbers). It recognizes that Deuteronomy introduces a series of books influenced by Deuteronomy called the Deuteronomistic History consisting of the books of Joshua, Judges, 1 & 2 Samuel, and 1 & 2 Kings. 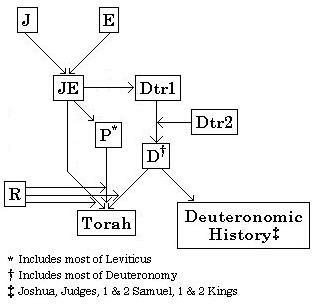 Nevertheless, while the composition of of the Deuteronomistic History was likely dependent on Deuteronomy, this does not demonstrates a Tetrateuch prior to the final redaction of the Pentateuch as it is now known. 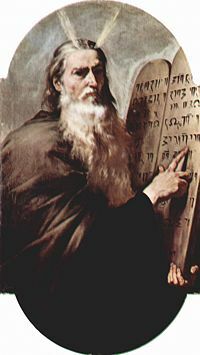 Classical Judaism regards Moses as the author of the Pentateuch, receiving it from God either as divine inspiration or as direct dictation together with the Oral Torah. The Talmud says that God dictated four books of the Torah, but that Moses wrote Deuteronomy in his own words (Bavli, Meg. 31b). However, over the years, the Rabbis raised several questions about this belief, including the record in Deuteronomy 34 of Moses' death, which he seemingly could not have written. The Talmud explains this by saying that Moses wrote it in tears in anticipation of his death. Some believe that Joshua added these words after Moses died, which seems to be supported by the facts that Moses' death is recorded in the last chapter of the last book that Moses supposedly wrote, that the next book is Joshua (which, according to Jewish tradition, was written by Joshua himself), and that the final verses of the book of Deuteronomy read like an epitaph to Moses. The Talmud (Sabb. 115b) states that a peculiar section in the Book of Numbers (10:35–36, surrounded by inverted Hebrew letter nuns) in fact forms a separate book. On this verse a midrash on the book of Mishle (also called Proverbs) states: "These two verses stem from an independent book which existed, but was suppressed!" Another (possibly earlier) midrash, Ta'ame Haserot Viyterot, states that this section actually comes from the book of prophecy of Eldad and Medad. With these caveats, classical beliefs hold that the Pentateuch was entirely or almost entirely Mosaic and of divine origin. According to Jewish tradition, the Torah was revealed to Moses by God. The Talmud teaches that the Torah was created 974 generations before the world was created. It is the blueprint that God used to create the world. Everything created in this world is for the purpose of carrying out the word of the Torah, which was then bequeathed to the Jews through Moses. Rabbinic writings offer various ideas on when the Pentateuch was actually revealed to Moses. According to datings of the text by Orthodox rabbis, the revelation at Sinai occurred in 1280 B.C.E. Some rabbinic sources state that the entire Pentateuch was given all at once at this event. In the maximalist belief, this dictation included not only the "quotes" that appear in the text, but every word of the text itself, including phrases such as "And God spoke to Moses…," and included God telling Moses about Moses' own death and what would happen afterward. Other classical rabbinic sources hold that the Pentateuch was revealed to Moses over many years, and finished only at his death. Abraham ibn Ezra and Joseph Bonfils observed that some phrases in the Pentateuch present information that people should only have known after the time of Moses. Ibn Ezra hinted, and Bonfils explicitly stated, that Joshua (or perhaps some later prophet) wrote these sections. In Christianity, the Pentateuch forms the beginning of the Old Testament. Thus, the Christian Bible incorporates the Pentateuch into its canon. While different Christian denominations have different versions of the Old Testament in their Bibles, the five books of Moses are common to them all. The Pentateuch was translated from Hebrew into Greek as part of the Septuagint, the Greek Old Testament; this was the Bible of the early Christian church. Origen's Hexapla placed side by side six versions of the Old Testament, including the second-century Greek translations of Aquila of Sinope and Symmachus the Ebionite. Saint Jerome's Vulgate Latin translation dates to between 382 and 420 C.E. Translations of the Old Testament into vernacular languages were discouraged in medieval Christendom. An exception was the translation of the Pentateuch ordered by Alfred the Great around 900 C.E., and Wycliffe's Bible of 1383 C.E. Only with the Protestant Reformation did numerous vernacular translations of the Pentateuch appear. Christians value the narrative portions of the Pentateuch, the stories of Moses and the Patriarchs, as part of Christian history and as providing lessons for believers' lives of faith. However, they largely disregard the laws of the Torah. Most believe that the Torah constitutes the covenant with the Jews, while Christians have a different covenant, established through the atoning sacrifice of Christ. The Law reveals humanity's sinfulness, since no one can keep the commandments 100 percent. The Qur'an contains numerous stories about Abraham, Noah, Moses (Musa) and other figures of the Pentateuch. Many are quite similar to the Pentateuchal narratives. Some of these retellings seem to presume that the early Muslims were already familiar with the stories. A few add extra-biblical stories out of Jewish and Christian legend, which also must have circulated among the Arabs of Mecca. The Torah, which Muslims call Tawrat in Arabic, is regarded as the word of God that is binding for Jews. However, they also believe that this original revelation was modified (tahrif, literally meaning corrupted) over time by Jewish and Christian scribes and preachers, and therefore inferior to the Qur'an as a guide to truth. As an example of a discrepancy between the Pentateuch and the Qur'an, in the Qur'anic account of Abraham's sacrifice of his son, the boy is understood to be Ishmael, not Isaac. Muslims regard the Qur'an's account as more accurate. ↑ John Joseph Collins, The Bible After Babel (2005). Retrieved January 30, 2008. ↑ Shalom Carmy (ed. ), Modern Scholarship in the Study of Torah: Contributions and Limitations (Aryeh Kaplan, Handbook of Jewish Thought, Volume I). ↑ Gordon D. Fee and Douglas Stuart, How to Read the Bible for All Its Worth, 3rd edition (Zondervan, 2003, ISBN 0310246040). Alter, Robert. 2004.The Five Books of Moses. New York: W. W. Norton and Co.
Carmy, Shalom (ed.). 1996. Modern Scholarship in the Study of Torah: Contributions and Limitations. Jason Aronson, Inc.
Chavel, Charles B. 1971. Ramban: Commentary on the Torah. New York: Shilo Publishing House, Inc.
Cohen, A. 1956. The Soncino Chumash. London: Soncino Press. Dever, William G. 2003. Who Were the Early Israelites? Grand Rapids, MI: William B. Eerdmans Publishing Co.
Fields, Harvey J. 1998. A Torah Commentary for Our Times. New York: Union of American Hebrew Congregations. ISBN 0-8074-0530-2. Finkelstein, Israel, and Neil A. Silberman. 2001. The Bible Unearthed. New York: Simon and Schuster. ISBN 0-684-86912-8. Fox, Everett. 1995. The Five Books of Moses. Dallas: Word Publishing. Friedman, Richard Elliott. 2003. Commentary on the Torah. San Francisco: HarperSanFrancisco. ISBN 0-06-050717-9. Hertz, J.H. 1985. The Pentateuch and Haftorahs. London: Soncino Press. Hirsch, Samson Raphael, and Isaac Levy (eds.). 1999. The Pentateuch. 7 vols. London: Judaica Press. Kaplan, Aryeh. Handbook of Jewish Thought, Volume I. Moznaim Pub. Kushner, Lawrence, and Kerry M. Olitzky. 1992. Sparks Beneath the Surface; A Spiritual Commentary on the Torah. Northvale, NJ: Jason Aronson. ISBN 1-56821-016-7. Lieber, David. 2001. Etz Hayim: Torah and Commentary. Philadelphia: Jewish Publication Society (a Conservative standard). Leibowitz, Nehama. New Studies in the Weekly Sidra. Jerusalem: Hemed Press. Munk, Elie. 1994. The Call of the Torah: An Anthology of Interpretation and Commentary on the Five Books of Moses. Brooklyn: Mesorah Publications Ltd.
Plaut, W. Gunther; Bernard Bamberger; and William W. Hallo. 1981. The Torah: A Modern Commentary. New York: Union of American Hebrew Congregations. Rouvière, Jean-Marc. 2006. Brèves méditations sur la création du monde. L'Harmattan Paris. Sarna, Nahum M. and Chaim Potok (eds.). 1996. JPS Torah Commentary. Philadelphia: Jewish Publication Society. ISBN 0-8276-0331-2. Scherman, Nosson. 1994. The Chumash: Stone Edition of the Artscroll Chumash. Brooklyn: Mesorah Publications Ltd. (an Orthodox standard). "Pentateuch." Catholic Encyclopedia. (1913). New York: Robert Appleton Company. The Judaica Press Complete Tanach with Rashi. This page was last modified on 4 February 2019, at 23:17.